Costa Rica abolished its army 70 years ago. During national celebrations, children and the youth, as the main protagonists carrying the Costa Rican flag, proudly parade in their school uniforms. The image of a military parade with thousands of soldiers displaying their weapons and equipment is unknown to us. Along with the principles of freedom and democracy, the force of reason has prevailed throughout Costa Rican history. The abolition of the military is one of those exceptional steps that led Costa Rica to become a fairer more educated society, able to meet the most pressing needs of its population, focusing on human development rather than strengthening its military capabilities. 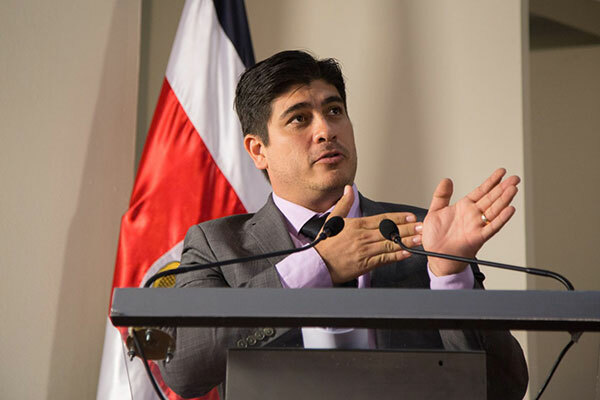 President Carlos Andres Alvarado Quesada of the Republic of Costa Rica. 코스타리카는 70년 전 군대를 해산했습니다. 그리고 국가 기념일에는 아이들과 젊은이들이 코스타리카의 깃발을 들고 주인공이 되어 그들의 교복을 입고 자랑스럽게 행진합니다. 우리 나라에서는 수 천 명의 군인들이 무기와 장비를 갖추고 행렬하는 군사 퍼레이드는 찾아볼 수 없습니다. 자유와 민주주의의 원칙을 따라, 이성의 힘이 코스타리카 역사 전반에 걸쳐 우세해졌습니다. 군대폐지는 코스타리카가 군사력을 강화하는 대신 인류의 발전에 중점을 두고 국민의 가장 시급한 사안을 충족시키고, 공평한 교육을 받을 수 있는 사회가 되도록 이끈 예외적인 조치 중 하나라고 할 수 있습니다. Kenya attained independence in 1963 and Dec. 12, 2018 marks the 55th anniversary as an independent state. This date, referred to as Jamhuri Day, is the symbol of rebirth for our nation and an opportunity for each and every Kenyan to renew their commitment to the ethos that constitute the fabric of our identity as a people encapsulated in our rallying call: Peace, Love and Unity. Costa Rica abolished its army 70 years ago. During national celebrations, children and the youth, as the main protagonists carrying the Costa Rican flag, proudly parade in their school uniforms. The image of a military parade with thousands of soldiers displaying their weapons and equipment is unknown to us. Former UN Secretary-General Ban Ki-moon says North Korean leader Kim Jong-un should take concrete actions for complete denuclearization if he wants the United Nations to lift sanctions on his country. Ban made the remark in an interview with the Associated Press in Tokyo on Monday on the sidelines of an event organized by the World Bank. Hyundai Motor, Kia Motors Report Declining Sales in Nov.
South Korea's biggest automakers, Hyundai Motor and its affiliate Kia Motors, posted dwindling sales last month compared to a year earlier. Hyundai Motor said on Monday that its combined sales at home and abroad stood at 403-thousand-381 in November, down by four-point-two percent on-year. A United Nations choir has performed in New York wishing for peace on the Korean Peninsula. The UN Staff Recreation Council Singers(UN SRC Singers), formed by UN employees, put on the “UN Singers Peace Concert” for South and North Korea twice last week. They performed at the UN headquarters on Monday and Carnegie Hall on Tuesday. The wife of Gyeonggi Province Gov. Lee Jae-myung underwent prosecution questioning for a third time on Tuesday over allegations she posted slanderous messages about her husband's political rivals. Kim Hye-kyung appeared at the Suwon District Prosecutors' Office at around 10 a.m. Tuesday's questioning follows two previous interrogations in early November and late October. South Korean President Moon Jae-in on Tuesday highlighted the importance of a proposed visit by North Korean leader Kim Jong-un to his country, saying it may help speed up the North's denuclearization process. Moon said the proposed visit may also help ensure greater success in the second U.S.-North Korea summit, expected to be held early next year. Asiana Airlines Inc., South Korea's second-biggest full service airline, said Tuesday it is set to pay most of the 2.1 trillion won (US$1.89 billion) worth of its debt that will mature this year. At the end of November, Asiana Airlines secured 457 billion won in funds through the sale of parent Kumho Asiana Group's headquarter building and a stake in affiliate CJ Logistics Corp., and the issuance of convertible bonds and asset-backed securities. Such transactions will help cover payments that must be made this year, the company said in a statement. South Korean tech giant Samsung Electronics is poised to conduct its year-end personnel reshuffle, which is widely expected to reflect anticipated slow growth for the chip and smartphone markets in 2019, industry sources said Monday. Reports and sources gave mixed views, with some predicting the reshuffle would be “conservative,” and others forecasting it would be aimed at “reducing the top brass.” Samsung is highly anticipated to promote only a minimum number of senior officials to executives instead of fully replacing retiring seniors. The Ministry of Economy and Finance was off to a rocky start Monday, as it faced mounting pressure with the delayed passage of next year’s state budget while its new minister nominee is set to have his confirmation hearing Tuesday. A concern for the ministry is that Minister nominee Hong Nam-ki could take office without a fixed budget plan, which could weaken the momentum of the government’s economic policies. Regulation is a topic that frequently comes up among foreign companies doing business in Korea. And that makes sense, as Korea ranks 51st among 67 countries on the FDI Regulatory Restrictiveness Index compiled by the Organization for Economic Cooperation and Development. 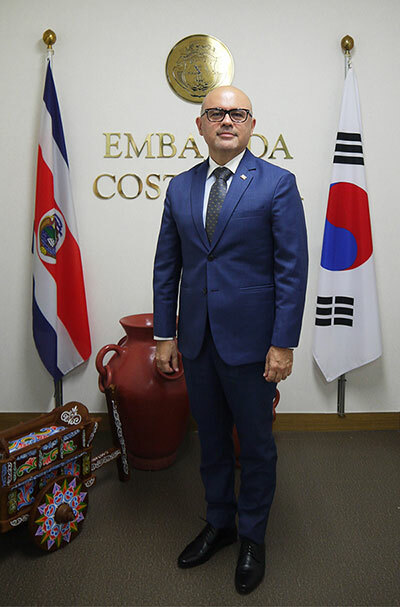 However, James Kim, chairman of the American Chamber of Commerce, contended that Korea is still not excessively particular in the regulatory environment and that any foreign companies doing business in any country should take different approaches to follow the nations’ own set of rules and regulations. South Korea and the United States have not yet made a decision on whether to continue suspending their joint military exercises next year despite an earlier pledge to finalize the schedules for the drills no later than Dec. 1. The pledge was made on the sidelines of the annual Security Consultative Meeting in Washington in October. South Korean Defense Minister Jeong Kyeong-doo said he would announce the 2019 joint exercise plans under close consultation with U.S. Defense Secretary Jim Mattis, but no specific timelines or schedules have been confirmed. The United States naval base in Tokyo was busy, continuing readiness preparations to counter possible military provocations by North Korea despite the ongoing peace momentum on the Korean Peninsula. This does not mean that the U.S. and Japanese navies were holding a joint exercise by the time this reporter visited the base in Yokosuka, Tokyo on Nov. 26. Even if North Korea has not staged provocations this year, military officials from the U.S. and Japan were still working on the maintenance of their exceptionally large ships. South Korea's policies toward the North for the next five years have been drawn up based on agreements reached at the first and third summits between leaders of South and North Korea, according to the unification ministry. The ministry on Monday unveiled the plans for 2018 and an outline of the policies to be carried out from 2018 to 2022, after reporting them to the National Assembly. Bankruptcies among the self-employed are on the rise despite government efforts to support small businesses. Main opposition Liberty Korea Party lawmaker Choo Kyung-ho analyzed data compiled over the past three years and found that bankruptcies among self-employed people with staff surged 36.1 percent in the first nine months of this year to 8,373 people. In the same period last year, bankruptcies declined 15.5 percent. More foreign airlines have taken routes passing through North Korea's flight information region since August. Until July, only Russia sent airplanes through the area due to missile and other military threats from the North. But now Germany, the Netherlands and Taiwan also used the route when traveling to and from South Korean airports, according to data from the Ministry of Land, Infrastructure and Transport. Korean Self-Driving Car Starts Trial Deliveries in U.S.
A self-driving car developed in Korea began delivering products in Silicon Valley in California on Oct. 29. The car, called SNUver, began a trial service delivering products for Ace Hardware, which operates 500 hardware stores. Seo Seung-woo, the lead developer at Seoul National University, after which the car is named, and his students launched a startup called ThorDrive in 2015. One out of every five adults in South Korea is a member of the “happiness disadvantaged class,” a recent survey found. These individuals believe that they are less happier than the national average, their situation is not better than the past, and it won’t improve in the future, either. Groups that were disproportionately represented in the happiness disadvantaged class were the poorly paid and educated, people in their 60s and above and men in their forties and fifties. US President Donald Trump expressed his “friendship and respect” for North Korean leader Kim Jong-un while speaking to Chinese President Xi Jinping, the White House reported. Trump’s remarks are thought to emphasize that the US remains committed to engaging in dialogue with North Korea, even though its denuclearization talks with the North appear to have stalled. As was illustrated by the recent fire at a “gosiwon” (a cramped boarding house typically used by students that have since devolved into housing for impoverished classes) in which eighteen people were killed or injured, the housing conditions at gosiwon are far too awful to regard them as housing. There are no accurate statistics about the number of South Koreans who live in informal housing, including gosiwon and flophouses, as well as establishments open to the public such as comic book stores and bathhouses. “China has agreed to reduce and remove tariffs on cars coming into China from the US. Currently, the tariff is 40 per cent,” U.S. President Donald Trump wrote on Twitter on Sunday. It appears that his latest remarks are aimed at stressing China’s instant concession after it agreed to take a "90-day truce" from its tariff war with the United States during the summit meeting on Saturday. A research center benchmarked exactly from the Korea Advanced Institute of Science and Technology (KAIST) will be established in Konza, the tech-innovation city of Kenya, which aspires to become the Silicon Valley of Africa. While there have been cases where KAIST partially exported its curricula or research programs to the Middle East or China, this marks the first time for the Korean technology institute to implement its education, research, and operation models in a foreign country since the school was founded in 1971. Hyundai Motor’s Genesis G70 has been named “the 2019 Car of the Year” by an American automobile magazine. While the luxury brand’s sports sedan is believed to have made a successful debut in the American market, attention is now focused on whether the South Korean automaker can take this as an opportunity to enhance the value of its Genesis brand in the United States. The elderly are being left behind as automation and mobile technology take over the daily lives of Koreans, adding to the growing alienation of senior citizens as the country ages at a breakneck pace. Kim Soo-kwang, a 72-year-old man who spent two decades of his life in Seoul before returning to his hometown of Busan, says he still visits the capital by train once or twice a month to meet old friends. For younger passengers, getting train tickets is a breeze - all it takes is five minutes on Korail’s mobile application or website. But Kim says he doesn’t know how to use phone applications on his smartphone, and hesitates to ask his 45-year-old son every time he needs to buy a ticket. Korean women are ranked third in the OECD for average life expectancy. According to Statistics Korea 2017 figures, Koreans are now expected to live on average 82.7 years. That’s 3.5 more years than 10 years ago and 0.3 years longer than in 2016. For men, the life expectancy of those born last year is estimated to be 79.7 years. This is 0.4 years longer compared to those born in 2016. As a result, the life expectancy for Korean men ranks at 15th. A red light has switched on in the state administration of the Moon Jae-in government. There are some signs that generally indicate the weakening power of the government--the weakening of Cheong Wa Dae's control over public office; the moral hazard of civil servants; the power struggle in the ruling groups; and a divide among the supporters. Usually, these factors come together to bring down the president's approval rating. Recently, such factors have emerged simultaneously. For the first time, voices from the ruling party openly called for Cheong Wa Dae Senior Secretary for Civil Affairs Cho Kuk, responsible for discipline in Cheong Wa Dae, to step down. President Moon Jae-in and U.S. President Donald Trump held a summit on November 30 (local time) and shared the opinion that North Korean leader Kim Jong-un's visit to Seoul would "provide additional momentum" to the joint efforts by South Korea and the United States to establish peace on the Korean Peninsula. During the summit, President Trump affirmed his willingness to hold a second summit with North Korea early next year. We welcome that the leaders of South Korea and the U.S. reaffirmed their willingness to engage in dialogue with North Korea and to continue the drive toward peace on the Korean Peninsula by supporting Chairman Kim Jong-un's visit to Seoul. Justice Delayed for 18 Years: What Did the Courts Do During That Time? The victims of forced labor during Japanese occupation finally won in their claim for damages against the Japanese company, Mitsubishi Heavy Industries. The latest ruling followed the precedent last month, when the Supreme Court recognized the liability of the Japanese firm, Nippon Steel & Sumitomo Metal Corporation. According to the Supreme Court, "The claim for damages by the victims of forced labor was not included in the claims settlement signed by the South Korean and Japanese governments in 1965." Thus the court judged that the victims could make individual claims for damages. It is regrettable that it had to take eighteen years for the South Korean court to acknowledge the liability for damages of Mitsubishi Heavy Industries. This calls for some serious reflection in our courts. Henan Mingtai Aluminum Industrial, one of China's biggest aluminum sheet manufacturers, hit an unexpected hurdle in South Korea as some citizens and domestic firms launched a campaign to oppose the construction of a plant in a free economic zone. Supported by local government authorities interested in attracting foreign capital, Mingtai Aluminum has been allowed to build a plant in the free economic zone in the southern industrial port city of Gwangyang, home to the second plant of South Korea's top steel company, Posco. South Korea's state-run energy research institute developed a new technology for coal power stations using pure oxygen for circulating fluidized bed combustion to reduce the emission of pollutants such as carbon dioxide (CO2). The Korea Institute of Energy Research (KIER) said in a statement Monday that its researchers applied pure oxygen combustion to the circulating fluidized bed (CFB) to collect high-density CO2. The institute said that progress in its technology development could bring a new paradigm to the coal power plant market. A 26-meter-high electronic board with an 8K resolution light emitting diode (LED) display appeared in Incheon International Airport, South Korea's main gateway west of Seoul, to greet passengers with ultra high-definition media contents. Incheon airport authorities said Monday that the new board was put into service on December 1 as a new landmark at the center of the first terminal, showing digital arts and various contents. A Chinese capital-led hospital that would make the first for-profit medical facility in South Korea is expected to open early next year in the southern resort island of Jeju despite residents’ opposition. Won Hee-ryong, Jeju Governor who has the last say in the affair on Monday said he would soon decide on the matter based on “credibility of Korean administration and the national name as well as the impact on the regional economy.” Given the reasons he has cited, Won is expected to give a go-ahead to the hospital opening that had been stalled even as construction and recruitment became complete in the summer of last year due to opposition from Jeju residents. To show off its IT prowess, South Korea raised the bar in digital signage display by installing a building-size 8K resolution at the heart of the country’s main gateway, Incheon International Airport’s Terminal 1. The LED tower, which is 27 meters in height, 10m in length and 3.5m in width, was plugged in last Saturday to exhibit artworks of globally renowned media artists and provide information such as weather and time of many countries and cities in truly lofty manner. South Korea’s MP Group, which operates home-grown pizza chain Mr. Pizza, is very likely to be ousted from the secondary Kosdaq market as the exchange’s review panel ruled for the delisting on Monday. The deliberation is subject to approval of the Kosdaq market committee for a final decision. The latest ruling comes after the company had been embroiled in a number of scandals. The owner family was found to have profiteered by overcharging franchisees in cheese supplied by a company owned by the family of former MP Group Chairman Jung Woo-hyun. Jung was also accused of being involved in unfair practices such as opening new stores near outlets operated by former franchisees in retaliation for withdrawing from MP Group.